I'm just editing my fantasy epic for publishing and rewriting an unrelated story. I'm seriously lazy when it come to the latter, though.so I'm alternating reading days with writing days so I get a bit of both done. Misha - I think you are right. I should just kick back and catch up on my reading. But I feel so guilty when I don't write. Good-luck with the editing. I can just imagine how stressful it can be. I always find editing and rewriting to be the worst. Best wishes! Please don't feel guilty. I think not have an urge to write is the brain's way of saying it needs a little holiday. I'm editing something I wrote a while back--fresh eyes are making the editing go much faster. I haven't had the time to write. The urge has been there but no time. I've discovered that the time away is always a good thing. Whenever I've stepped away, I came back with a new perspective. As for dishes, you definitely need a dishwasher. LOL. And...many thanks to you for helping us get the word out. Lots of writerly love!!! these days I am too going though a tough and confusing phase. But, I also know that eventually things will go fine. Somehow that always happens. We all have restless patches. Without realising it, I have spent the last six months doing very little writing, although I thought I was progressing! Obviously needed the break, as perhaps you do. Kind regards, Carole. I'm snooping out publishers right now, and I have YA, so I'll check them out! I love that cover. 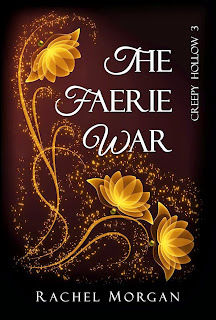 I've seen Faerie War somewhere else too! Kittie - Good-luck with the editing. Perhaps my mind needs a bit of rest. You are so right. Thank you. TC Mckee - You are welcome. I wish you all the success in the world. I so need to buy a dishwasher. Jyoti - Thank you. I hope you get your confused situation sorted out. All of the best. Carole - Thank you. I think I am going to give the writing a break. Who knows, perhaps it is just what I need. Katie - I think the cover is pretty cool as well. Good-luck with finding a publisher. I know it is not easy. Definitely try to write something, anything - see if it helps. It can't hurt. Tonja - Thank you. I will try. I love that nerdy book fish logo! Sorry to hear that you haven't been in a writing mood, Murees. Have you tried something different? Like freestyle writing? Set your timer for about 15 minutes, and then write whatever comes to mind... don't stop to read or edit. You can find daily prompts at oneword.com. Michelle - I know, it is cool, right? Thank you for the great tip Michelle. I will give it a try.